Understand which features matter most so that you can find the space heater that works best to warm up your home. Ever-rising utility costs can make it difficult to heat an entire house during the coldest months of the year. To keep occupied areas comfortable—say, the home office from 9 to 5 or the living room during a movie marathon—while the rest of the house remains heated just enough, many homeowners turn to space heaters as a means of conserving energy. Consider safety first. Space heaters are a leading cause of house fires in winter, so it’s smart to stock one that boasts additional safety features that reduce the risk of burns and fires. Manufacturers have introduced automatic shut-offs that kick in when a unit overheats or gets inadvertently knocked over, and exterior cases keep a unit cool to the touch while the heater runs. Some models even come equipped with motion sensors that detect and turn the heater off when a pet or child comes too close. For extra peace of mind in your purchase, look for the letters “NTRL” on the space heater packaging; these indicate that the model has been tested for safety by the Nationally Recognized Testing Laboratory. Note: Before heading out to buy a space heater, call your homeowner’s insurance agent. Some insurance policies will not cover damages from a fire caused by a space heater. Know your heating needs. A common consumer complaint about any space heater is that the unit does not warm the room adequately. Assessing your needs—as well as a room’s limitations—will help ensure you find the best space heater to meet your needs. As a general rule of thumb, select a space heater that will produce 10 watts of power for every square foot of floor space. For instance, to heat a 10-foot by 12-foot room, you’d need to purchase a 1200-watt space heater. A very large room may require more than one space heater to maintain a comfortable temperature throughout. 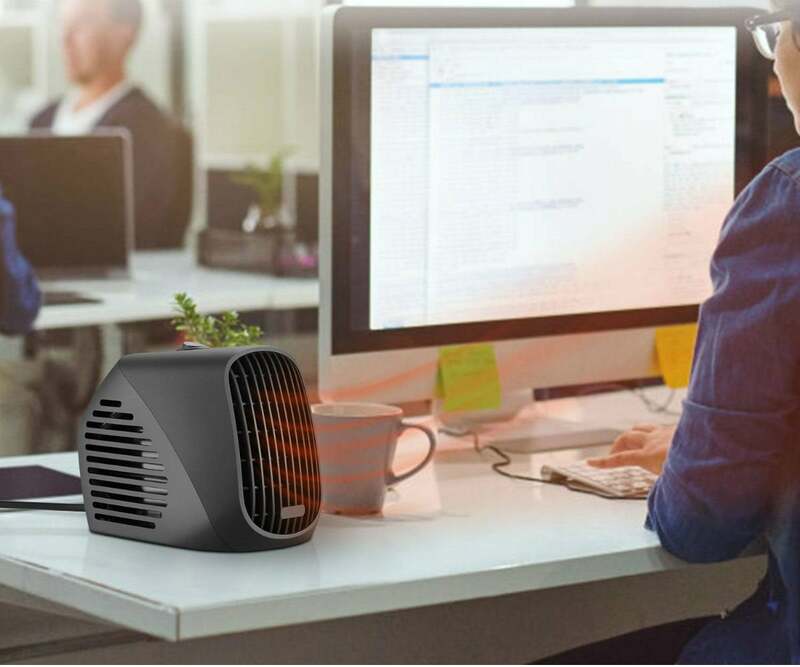 Other factors that affect a space heater’s efficiency include ceiling height, the insulating factor of the exterior walls, the number of windows, and the available outlets. While high-wattage heaters offer more heat than lower-wattage models, they’re limited to the capacity of the electrical outlets they plug into. Since a home’s standard 110-volt electrical outlet can only provide 1,500 watts of power, that’s what the wattage would cap at for any machine plugged into it. 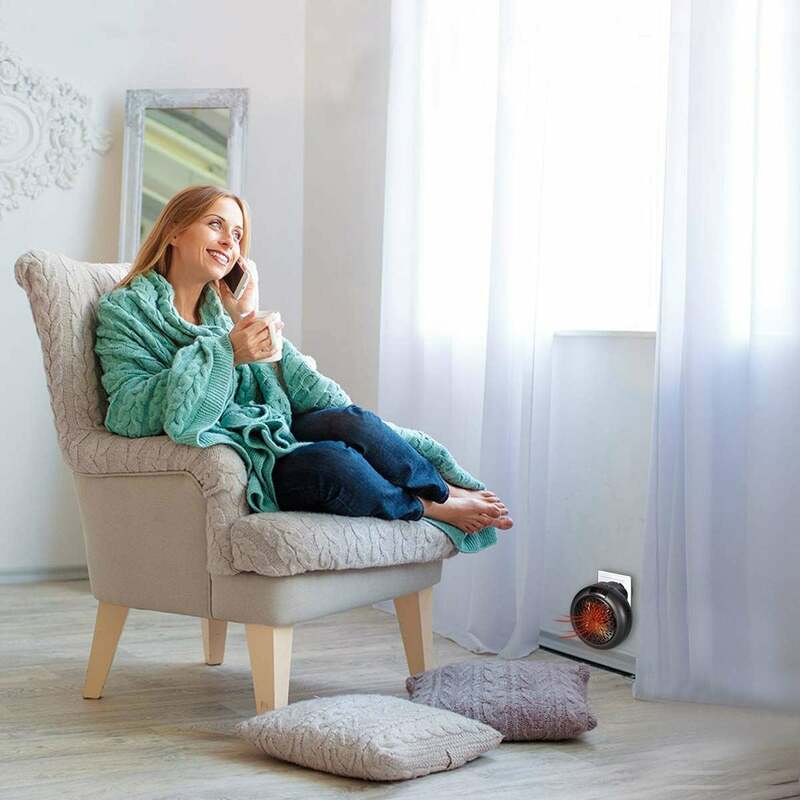 Fan space heaters are among the least expensive models on the market, ranging in price from $25 to $80, but the design—one that heats the air around an electric coil or wire elements and disperses the heat with a fan—does not offer the same efficiency as other space heater types. Plus, the fan motor can be quite noisy. They’re best saved for rooms without drafts and for when you need to heat up a small space quickly. Convection space heaters warm air over ceramic plates or disks and allow it to flow naturally back into the room. Some models do include fans for quicker heating, and, like plain fan heaters, they work best in rooms without drafts. Convection heaters come in compact or tower models, often with exterior cases that are cooler to the touch. Prices range from $30 to $80, depending on wattage and added features. 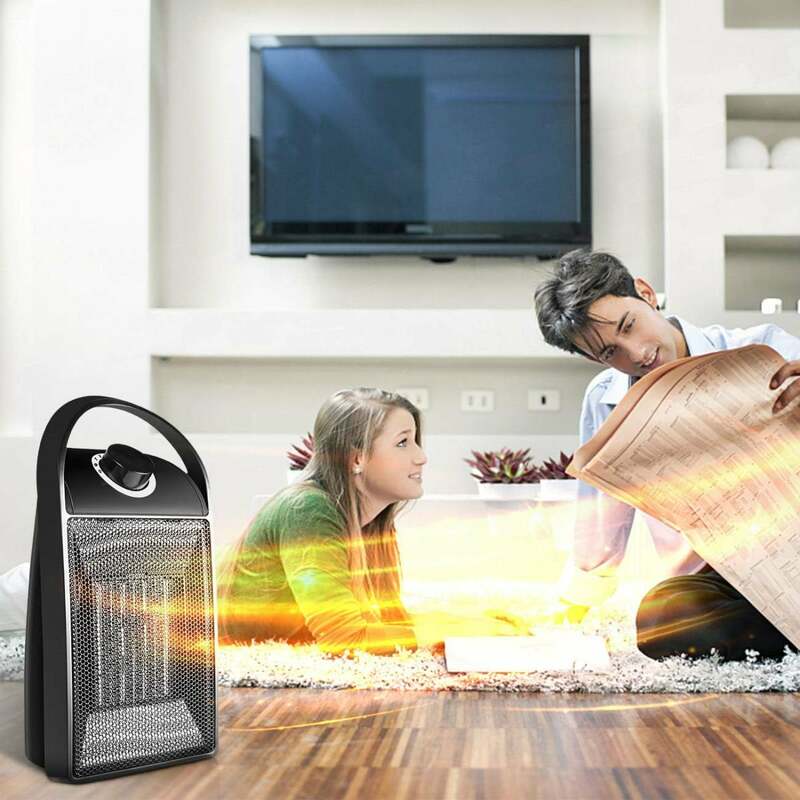 Infrared space heaters are among the quietest options for the home, starting at $60 per unit. They generate heat quickly, not by heating the air in the room but by radiating heat to the objects in front of them. Because this type of heater heats you—not the air—it’s a good choice for use in drafty rooms. Just aim it at your chair and enjoy. 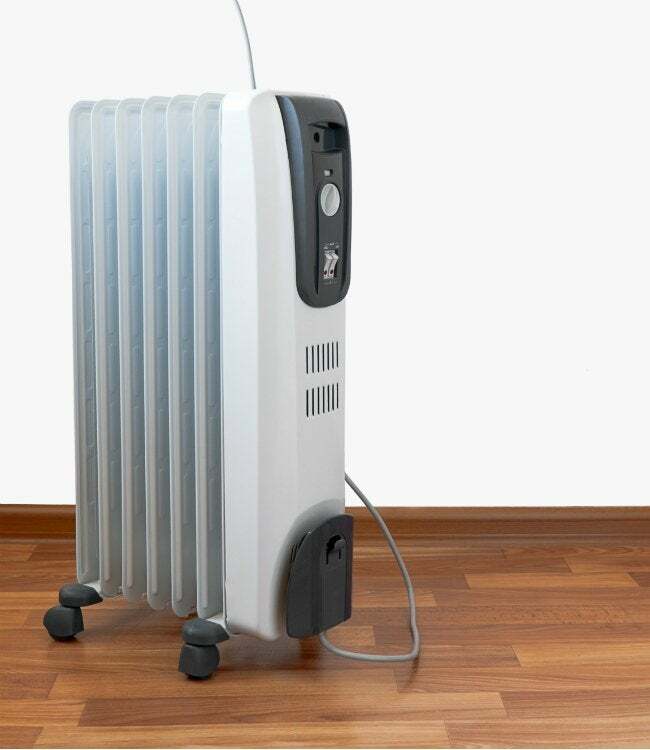 Oil-filled space heaters take a while to heat up but, when they do, radiate continuous warm heat. These units are particularly well suited for larger rooms where they’re left on for long periods. Due to the weight of the oil and steel casing, many of these heavy heaters utilize wheels for easy relocation. Prices start around $65 for small units and run into the hundreds for larger models. Micathermic space heaters combine convection and radiant heating processes. Designed as a panel to stand or hang on a wall as you would a picture, they create a welcoming ambiance for all of the senses by mimicking the look of a real fire and radiating heat. Some models include fans for greater efficiency and remote controls for extra convenience. These advanced heaters range in price from $300 to over $1,000 for designer models. After comparing space heater reviews from consumers, we’ve rounded up six of the most highly rated models available today to help you find one that fits your home’s needs and your wallet’s budget. No matter where you need a little extra heat, one of the following six space heaters is sure to fit the bill. You won’t have to shout to be heard over the Fannel Ceramic Space Heater while it’s running. Amazon buyers award the Fannel a resounding 4.8 stars for its quiet operation and its ability to quickly heat rooms up to 150 sq. ft. It comes with an adjustable thermostat, an over-heat shutoff, and a tip-over shutoff as well. At less than 15 inches high, and weighing just over 2 lbs., the Fannel heater is small on size but big on heat output. It comes with an easy-carry handle for moving from room to room as needed. When you need a little extra heat on a bedside table, a countertop, or a desk (or under it), you won’t go wrong with the NEXGADGET Mini Space Heater. Happy Amazon buyers claim the NEXTGADGET is “small but mighty” and award it 4.4 stars for its ability to warm small spaces (4 to 7 feet away from the heater) without taking up a lot of room. Its tiny size—less than 7 inches high and 5 inches wide—makes it perfect for setting on a tabletop. It comes with a turbofan to warm you up quickly, and a fan-only option for use on hot days. It features both over-heating and tip-over protection, and the fan’s housing remains cool to the touch even when the space heater is running. When you need continuous heat in rooms up to 160 sq. 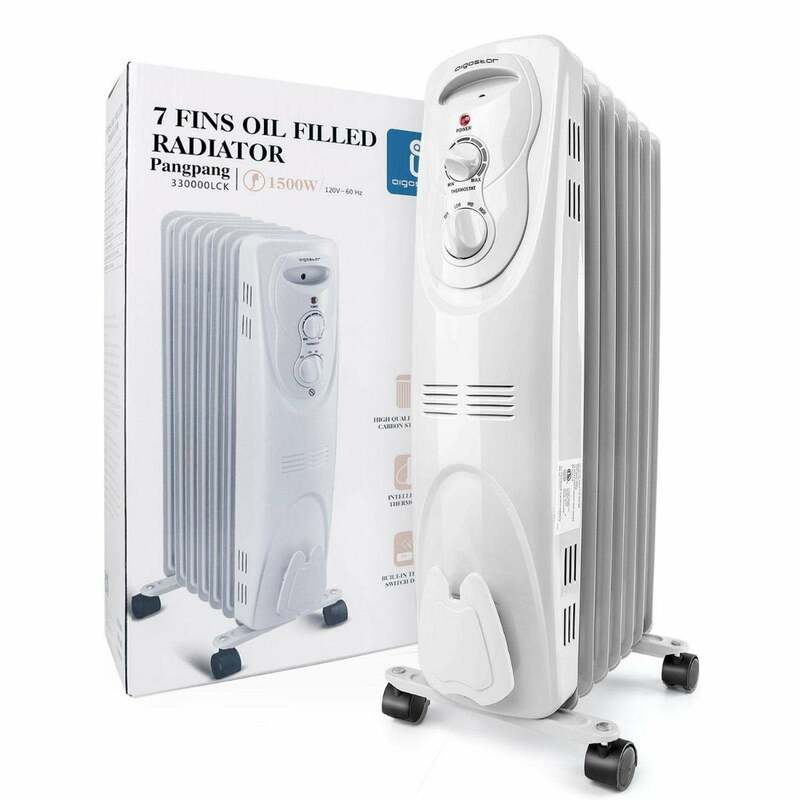 ft., look no further than the Aigostar Pangpang Oil-Filled Radiator Space Heater. This large wheeled radiant heater (26 inches high by 15 inches wide and weighing nearly 20lbs.) is designed to heat an entire room without making a sound. It comes with a programmable timer, three heat settings, and a tip-over shutoff. The heater oil comes in a permanently sealed unit to prevent leaks. Because the Aigostar is a true radiator, it becomes very hot to the touch, so it isn’t appropriate for homes with toddlers. Amazon buyers love the comforting warmth of the 4.7-star space heater: It takes 20 minutes to heat up, but once it’s warm, it continues to radiate warmth throughout the room. 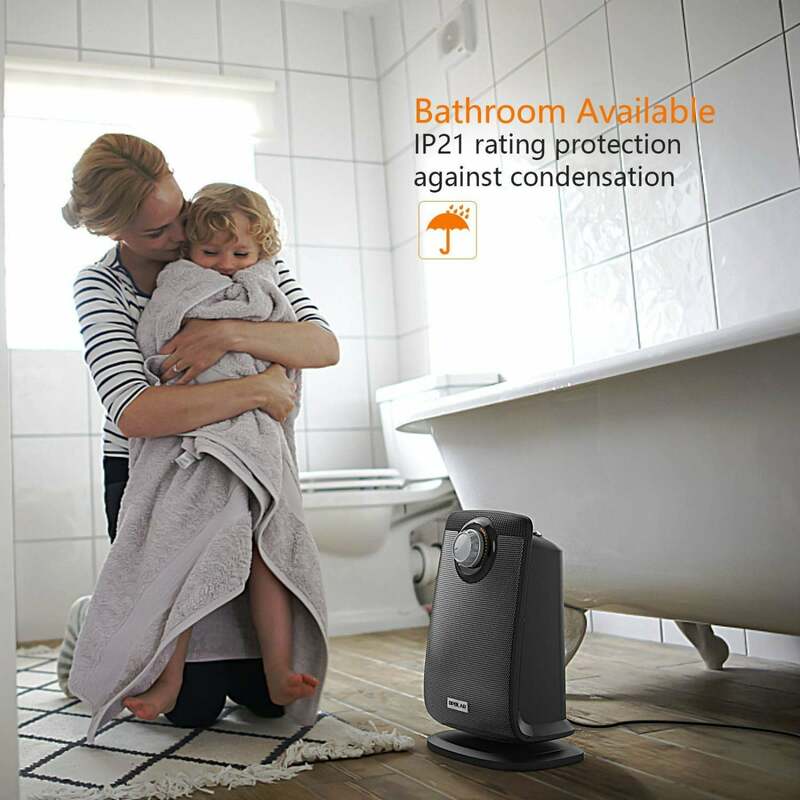 Most space heaters are not recommended for use in steamy bathrooms due to the risk of condensation forming on the heater and causing it to short out or malfunction, but you don’t have to worry about that with the OPOLAR Ceramic Bathroom Space Heater. It features the waterproof housing and circuit protection plug that are necessary for functioning in the bathroom so that you can step out of a shower without feeling immediately chilled. (Like all electrical appliances, however, do not set the heater in standing water.) This 4.1-star space heater features both over-heat and tip-over shutoff protection, an adjustable thermostat, and a handle for easy carrying. The OPOLAR weighs in at just over 4 lbs. and is less than 14 inches high and 9 inches wide. It also features 80-degree oscillation for even heat distribution. 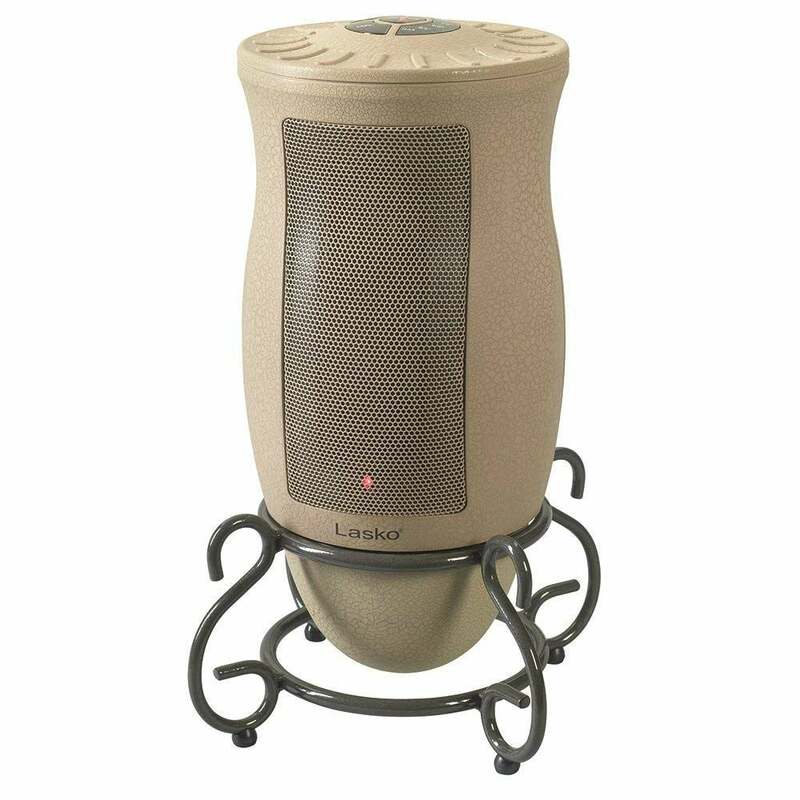 The Lasko Designer Series Space Heater comes in an attractive soft tan color, features a smooth contoured shape, and rests on an ornate base, making it look more like a work of art than a space heater. Visitors to your home won’t even know it’s a space heater! It’s not just for looks, however; it effectively heats rooms up to 150 sq. ft. Switch between its adjustable heat settings via the remote—even program it in advance to turn on and off when desired—and the Lasko fan oscillates smoothly from side to side for uniform heat distribution. Amazon buyers award the fan a hearty 4.4 stars for looks, quiet operation, and unobtrusive heating. Need a little extra heat when you’re on the go? If so, the Rxment Instaheater Miniature Wall Space Heater is just the ticket. This minuscule space heater (measuring just 5.6 by 5.5 by 4.5 inches and weighing in at just over 1 lb.) plugs directly into the wall to offer soothing warmth no matter where you are. Carry it from room to room as you go about your activities, or take it to and from work. As long as an outlet is nearby, you’ll have instant heat in a 3 to 6 ft. space in front of the space heater. Amazon buyers love the handy little Rxment heater, giving it an enthusiastic 4.4 stars for on-the-spot warmth, portability, and convenience. It comes with an adjustable thermostat, a digital display, and an easy On/Off switch.